A beautiful coat begins with good nutrition and health. The Pomeranian is a small dog known for long, fluffy, creamy-to-golden hair. 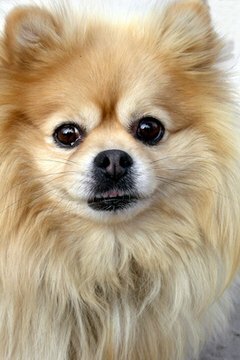 Keeping a Pom clean can be a challenge -- outdoors, these highly energetic dogs get dirty quickly and easily. However, with good care and grooming, a Pomeranian's coat can achieve a luster worthy of a show dog. Provide proper nutrition and exercise so your Pom can grow a healthy coat. If your little pal is eating poorly, overweight and inactive, all the grooming in the world will not help his coat look healthy, vibrant and shiny. Protect your Pomeranian against fleas, ticks and internal parasites that can cause poor health, dry skin and scratching, all of which are damaging to the coat. Brush your Pomeranian's coat twice a week. Use a comb to remove any tangles or mats first. Mix a small amount of conditioner and water in a spray bottle to spritz on the Pomeranian's hair before brushing with either a pin brush or bristle brush. Bathe your Pomeranian as needed with a shampoo formulated for long-haired dogs; don't use human shampoo, as it can dry his skin. Rinse his coat thoroughly to remove all soap residue from the fur; continue to rinse even after it appears the water is clear to make certain all soap has been removed from his coat. Rub a pet-formulated conditioner into your Pomeranian's coat after towel-drying. This will make his coat easier to comb out, and it will also add shine and luster to his fur. 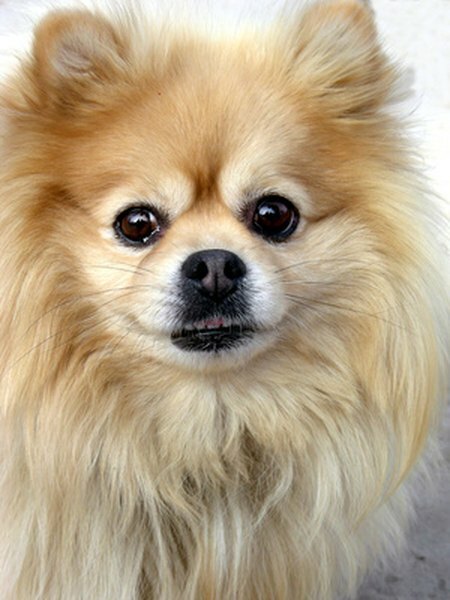 Spray your damp Pomeranian's fur with a "finishing spray" of the type used on many show dogs. These conditioning sprays are designed to add a shiny luster to the fur after it is dry. A Pomeranian's adult coat does not come in until he is approximately 2 years old; puppies will go through various stages of coats until then. Using a brush on a Pomeranian when the coat is dry can cause hair breakage.